Precision optics offer superior color correction and tack sharp images. The Celestron Ultima 80 Spotting Scope offers 50% brighter images than the 65mm. Eyepiece angled at 45 allows tripods to sit at lower position for more stability. The Celestron Ultima 80 Spotting Scope comes standard with a 20-60x zoom eyepiece. 8-24 eyepiece zoom offers 20X to 60X magnification. Soft, green rubberized body for secure grip. Measures approximately 16 inches long and weighs 57 ounces. The Celestron 45 Zoom UpClose Refractor Spotting Scope features high quality Celestron optics with a full 60mm aperture. Angled eyepiece allows for extended viewing comfort. With 20 to 60X magnification, the Celestron 45 Zoom UpClose Refractor Spotting Scope gets you close to the action. Waterproof and lightweight, this ultra-portable spotting scope is perfect for birding, hunting, target shooting, nature studies and more. The Celestron Regal M2 100ED Spotting Scope is optimized to provide the sharpest images available for birdwatching, nature observing, long distance viewing, and casual astronomical observing. ED Objective Lens minimizes chromatic aberration, accurate color reproduction, increased resolution and contrast. 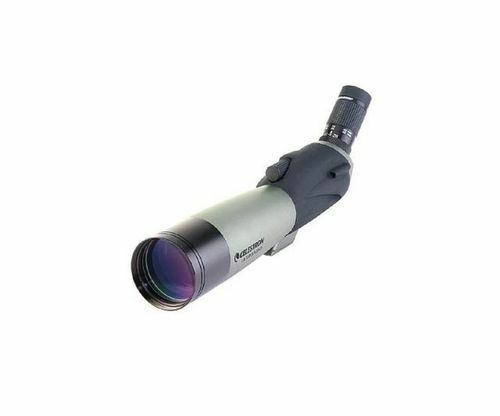 22x-67x Zoom Eyepiece: Adjustable magnification, giving you a wide field of view for general viewing and detailed up close viewing when needed. Twist-up eyecup for correct positioning of the user's eyes for comfortable viewing with or without eyeglasses. Dimensions: 19.25" x 4.75" x 4.75"
The Celestron Regal M2 65ED Spotting Scope is optimized to provide the sharpest images available for birdwatching, nature observing, long distance viewing, and casual astronomical observing. 16x-48x Zoom Eyepiece: Adjustable magnification, giving you a wide field of view for general viewing and detailed up close viewing when needed. Twist-up eyecup for correct positioning of the user's eyes for comfortable viewing with or without eyeglasses. Dimensions: 13.1" x 3.75" x 4.6"
Note :The Specifications and colors may vary due to recent improvements in design. The Celestron Regal 65 F-ED Spotting Scope is an air-spaced ED doublet with one element of fluorite, for superb color correction and sharpness. The rubber-coated body on this high-end spotting scope makes it waterproof and durable in any weather.